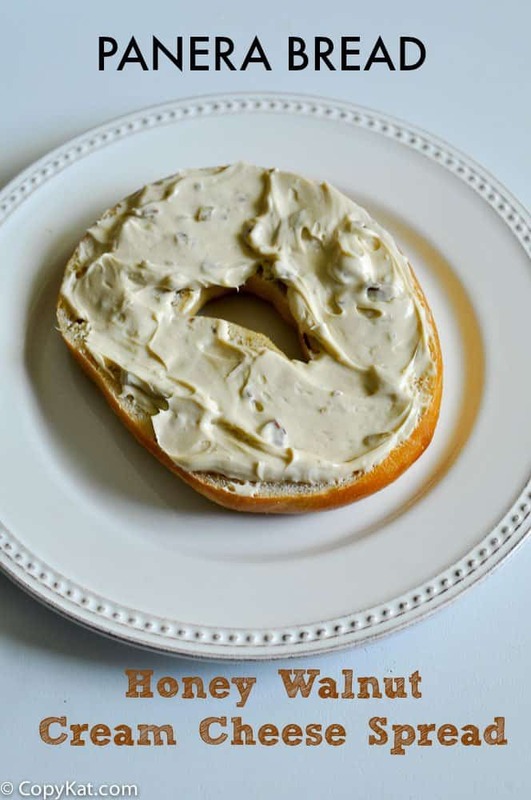 Panera Bread Honey Walnut Cream Cheese Spread is an amazing topping for bagels. I think one of the reasons bagels taste so much better when you go out is due to the toppings you can place on top of them. I don’t know why flavored cream cheese spreads are very tasty and they can be expensive. I love the way the Panera Bread Honey Walnut Cream Cheese tastes. It is as a rich sweetness of honey, crunchy walnuts, and just a touch of cinnamon make this perfect to spread on your bagel any time of day. The cream cheese they use is the lighter variety. Neufchatel, when whipped, is the perfect light and fluffy topping on a bagel. To make this recipe, I suggest that you allow the cream cheese to reach room temperature before starting this recipe. it will make it easy to whip in all of the flavors. If you want to add another nice touch I suggest that you toast the walnuts in a skillet for just a moment or two and allow them to cool. When toasting the nuts you bring out the natural oils in the walnuts and you will have an amazing flavor. Love a great smear for your bagel? Be sure to try Zabar’s Cream Cheese Spread. Love Panera Bread Recipes? Be sure to check out some of these copycat recipes. If desired toast nuts by placing in a skillet over medium heat. Heat just until the walnuts become fragrant. When the walnuts become fragrant remove from the skillet. Watch the skillet closely, there is a short time between the nuts being toasted and burnt. Allow the nuts to cool completely.In a small bowl combine room temperature cream cheese, honey, molasses, brown sugar, and cinnamon. Stir cream cheese until all of the ingredients are well blended. Chop walnuts and stir into the cream cheese.Store in an air-tight container in the refrigerator. Does the molasses add quite a bit? It’s not an ingredient I have on hand or would use very often. Just wondering if it’s one of the key ingredients for making it taste just like Panera’s! It does help a bit. It is an ingredient in their cream cheese spread if you read their label. You can try it without, and see what you thin. I’ve never had Panera anything, but that doesn’t matter, this looks like something I would love! Thank you. You don’t know what your missing. You have to try Panera Bread, OMG!!! Can you copycat their granny smith something or other (I can’t remember what its called but it’s made with green apples) dressing? I’ve looked EVERYWHERE FOR IT and Pantera doesn’t sell it by the bottle. This sounds fabulous. I just had to pin it. Thanks for sharing the Recipe! Thank you very much. I hope you enjoy the spread. I’m sure I will. I love all the ingredients. We don’t have a Panera Bread near us so I’ve never had the chance to try this type of spread but when I read your recipe I knew I had to pin it to try it soon. omg … I love the honey walnut cream cheese spread at Panera! Thanks so much for figuring out the recipe! Anytime! Thank you for dropping by! I love a good copycat recipe from Panera! Thank you for sharing! Thank you. I look forward to doing more recipes from there. Isn’t it funny what we get denied as children because our parents don’t like them.